I love traveling. Fixing my plans well in advance; whether going solo, in couplets or in groups, I just love to travel. And when you find the perfect companion; you’ll know when you meet someone like that, new places will turn into memories and beautiful shards of time will get coloured in that unforgettable soft hue. Against my usual style, before we arrived in Goa, no field trip plans had been made. This time I waited until the last minute, literally waited until my coach partner relieved me of my duties for the day. It was 12.30 PM and the moment I was free, I ran straight to find my friend and have lunch with her. After a thorough survey of beautiful locations nearby, we decided to rent a moped and head towards Panjim and nearby beaches with some of our other friends and colleagues. We were running short of time; as it often does in the company of a special friend, the sun seemed to be melting to set and end the day. I called the hotel guy ahead of time for inquiries, while we took the shortcut, walking on railway tracks that would magically wind up somewhere close to our Hotel Go Goa. I reached the hotel unaware that I would face more demons set against love’s last minute travel diaries. The bike rental in-charge sized me up and asked for a Driving License. When I bluntly denied ever possessing such official documents; slow music playing in my head, I was informed that Goa Traffic Regulations are very strict and I could get heavily fined. Abruptly, the music stopped, deep inside I was scared and simultaneously the image of me and my dear friend traveling by bus, pops in my head. Or even worse, the two of us on separate vehicles as pillions, exploring Goa… Noooo! I urge my brain to think while trying to look cool. I call a Goan friend, Shashank and ask him exactly how strict are the traffic rules in Goa while explaining my predicament. He chuckles good-naturedly and tells me that as long as I wear a helmet and don’t leave my vehicle in a No parking Zone, I should be fine. Knowing that I have slain the demon, I say to the in-charge, “I want to rent a moped. We will see about the police”. Finally we get the moped, and I emerge riding gloriously out of the garage. As Kamini hops on the backseat, I ask her if she is comfortable and assure that her safety is my responsibility and with that, we let the exploring commence! We simply follow our colleagues who know the route that we have no clue about! After a bit of cruising, we realise we cannot see anybody ahead of us or none of our friends who were behind us. The road leads straight ahead and we keep on following hoping to catch up with the others. We go… go… go… follow… follow… follow… until; like it happens to all who dare an adventure, we hit a crossroad. I ask two people for directions and also ask Kamini to direct us to Calangut Beach using google maps. I ride on and when I see the next diversion approaching, I ask “Left or Right?” to which she says “Chalo…(Go!!!)”. I laugh at her innocence and ask, “Where to?” and she laughs with me as she replies, “Go right… to the right!” She adds in a small voice, “Dinesh, maybe this isn’t the correct route. I think I don’t know how to use maps”. I guide the wheels to a side, halt and show her how to operate the Map App! At 4.30 PM, we reach Calangut beach at North Goa, park the vehicle and walk towards the beautiful bluish green sea that beckons. I don’t know when I started running to the water, splashing as I go… I call to Kamini and she is also running with her bag still on her shoulder. Amused at our excitement, I point at the bag and we laugh uproariously. I think to myself – we reached earlier than anyone despite being lost. What a great team me and Kamini make! Later, Manasvi, Priyanka and Ashish arrive at the beach. All of us go deeper in to the ocean except Manasvi who does not want to get soaked. Photographs and videos quickly bind seconds into little snippets that would get stored carefully within a happy heart. Soon enough, we return the moped and walk back to the railway station where our train awaits. I already miss Goa and my thoughts wrap me in a warm glow of a lovely trip with my dear friend. I now know that a perfect companion is one you can laugh with. No umbrella; No Driving License; No Experience of Goa; No route map and yet, we made amazing memories, filled with the sound of thunderous laughter. 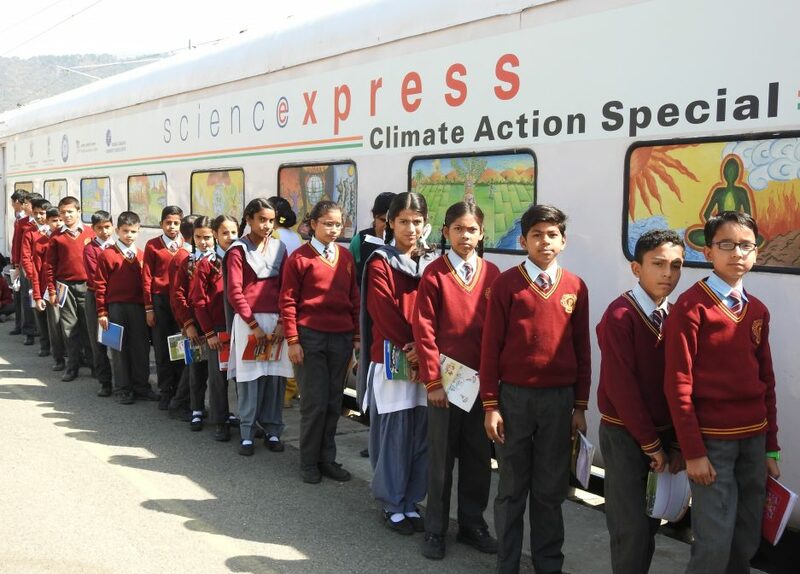 Journeying with Science Express is unique – some take back with them, experiences; some, delicacies; many, laid the foundation of their careers here; some found their soulmates and some even married them. I don’t know what I will take with me when I go back home but one thing is for sure, I have found the perfect companion with whom even unplanned trips are most gorgeous!